Options Orange - 5-9 lbs., 4 pk. Purple - 9 lbs., 4 pk. Orange - 5-9 lbs., 6 pk. Purple - 9 lbs., 6 pk. Orange - 5-9 lbs. 12 Month Supply Purple - 9 lbs. and over, 12 Month Supply Teal - 5 lbs. and under, 4 pk. Fleas are no fun, especially when they make a condo out of your cat. Advantage for cats kills all stages of fleas within 12 hours, and prevents the development of flea growth after just 2 hours! This unique tactic breaks the life cycle of the flea before they have any chance to retaliate. One application of Advantage II lasts for a full month, and is waterproof to help ensure that you get every single one of those days. Advantage for cats is safe to use on kittens 8 weeks and older, so start protecting your cat against the horrors of flea infestations today. As with any topical treatment, skin irritation may occur. If irritation does not subside or worsens, contact your veterinarian. Notify your veterinarian of any other treatments or medications. Notify your veterinarian of any other treatments or medications. Ask your veterinarian or consult with one of our pet care specialists at 1-800-844-1427. This information is for informational purposes only and is not meant as a substitute for the professional advice of, or diagnosis or treatment by, your veterinarian. Always seek the advice of your veterinarian or other qualified professional with any questions you may have regarding a medical condition. Never disregard or delay seeking professional advice due to what you may have read on our website. Our medications are FDA approved and/or EPA regulated when and as required by law. Advantage for cats contains Imidacloprid and Pyriproxyfen as its active ingredients. 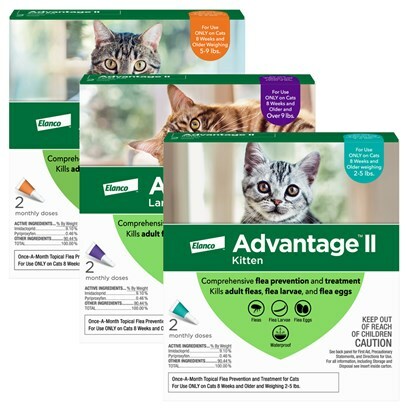 Advantage II for Cats is intended for use on cats of 8 weeks or older. Administer once monthly. Apply entire contents of the solution in a single spot, between the shoulder blades, directly into skin. Avoid letting the solution run off by applying slowly and directly to skin, not fur.